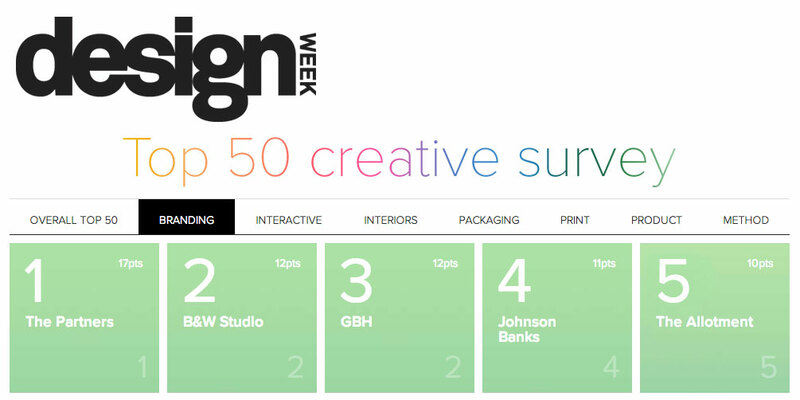 Design Week have recently released their renowned annual Creative Survey to the public, with creative agencies, and the industry as a whole looking on anxiously to see who made the top 50. Being just 4 years old, making the survey alone is a great achievement, however we’re delighted to announce that in the overall top 50 agencies in the UK, The Allotment came in joint 28th alongside global advertising agency, BBH. What’s more, in the branding category, we came joint 5th in the UK. Of course, we wouldn’t have managed this achievement without the wonderful creative partnerships we have established with our clients, partners and colleagues over the years. Thanks again to everyone associated with The Allotment, and here’s to a creative and transformative 2015!